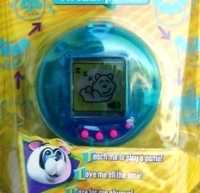 Bobo Panda Byte is a pet by Trendmasters (the same company that made the Kimiko Baby Byte (aka Sweet Baby, or Lovely Baby). This pet is much different from the Baby Byte. While the Baby Byte has curved lines that make different faces and gestures when in different combinations, the Panda Byte has the traditional pixeled screen with two rows of horizontal icons on the top and bottom. 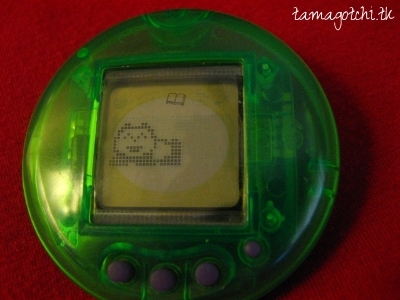 This virtual pet has surprisingly a lot of cool options and features. I have to say I am loving it a lot so far! Just some first initial impressions: This is a very musical pet. 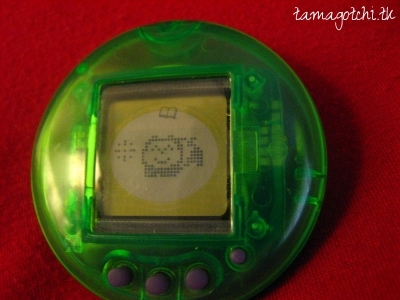 The shape is different from a lot of pets in that its very round, but the screen is very big. The background is a bit plain, but the pixels are nice because they are actually smaller (kind of like the 2004 Tamagotchi Plus). The character is VERY cute, but there is not much variation in the growth chart. The buttons are laid out weirdly (there are three regular sized button and one dedicated clock button off to the side). The first button goes through the menu. The third button selects an icon. The second button browses through the menus, and you must press the third button again to select a feature in the menu. So its a little topsy tervy in that regard. Now for the actual features: In the first row the first icon is an apple. If you select this icon you will be presented for options for food. During the first day or two the baby panda can only consume baby formula. After it grows a couple of times it can eat bread, an apple, candy and drink a glass of some liquid that has a straw in it. The second icon in the first row is a game icon. It has two options for games. The first game you must guess where the panda will pop out of the hole. If the panda does not pop out of the hole you chose then you get a point. It is a 2 out of three game. So if you guess correctly two or three times you win. The second game is rock paper scissors. You choose what the opponent will use, and then the game randomly selects an outcome. If the opponent loses then you get a point. The way these games are set up is a little odd, but its still easy to play. The second icon seems to be some kind of discipline/play icon. You can make the panda play hoola hoop, pet the panda to give it affection, discipline the panda by scolding it, make the panda study from a book, or let the panda play on a swing. Making it read a book will make its IQ go up. Letting it play seems to make the IQ go down. Giving it affectionate pettings will bring its happiness up like with playing games. The fourth icon in the first row is a medicine bag. You can give the panda some bottled medicine, a shot, or put it in an ambulence. I have not had to give it a shot or send it to the hospital yet, but as it has gotten older it seems to need medicine more often. The first icon in the second row is the weather icon. You can choose from an umbrella, a scarf or a hat to give to your panda. It will show weather conditions on the screen depending on what it needs. I'm not sure how this affects the health of the panda, though. The third icon is the meter icon (a clip board). This will show the weight and age of the panda, the temperature, the happiness (five hearts), the hydration level (five hearts), the hunger level (five hearts), and the IQ level (five hearts). The last icon in the bottom row is a comb. This icon is for selecting grooming methods. when the panda poops it will show him with his back turned to the screen sitting next to a pile of poop. You can select the toilet option. There is also an option to give the panda a facial. I am not sure what the other option is. Perhaps this is an option to give it a bath. Every time the panda loses half of a heart it will light up the question mark notification. This can get annoying, but it is a nice feature to have because this will prevent the panda's meters from getting really low. Another feature it shows is when the panda is sick it will show a skull next to its head. I got this Panda Byte used on eBay for $20. It was included in a lot of three (panda, P2, and 8-in-1 multipiets). I sent the P2 and 8-in-1 to my friend in exchange for $11. So basically the panda came out to about $10. These are hard to find, and usually new ones can cost up to $50 or more.